The high throughput sequencing of ribosome-protected RNA fragments, or ribosome profiling (Ribo-Seq), has uncovered the translation of thousands of novel small ORFs (< 100 amino acids) that were not annotated. These ORFs had remained hidden from annotation pipelines because of their small size, similar to that of randomly occurring ORFs in the genome. Some of these peptides show strong evolutionary conservation and have been found to play roles in development or other cellular processes. 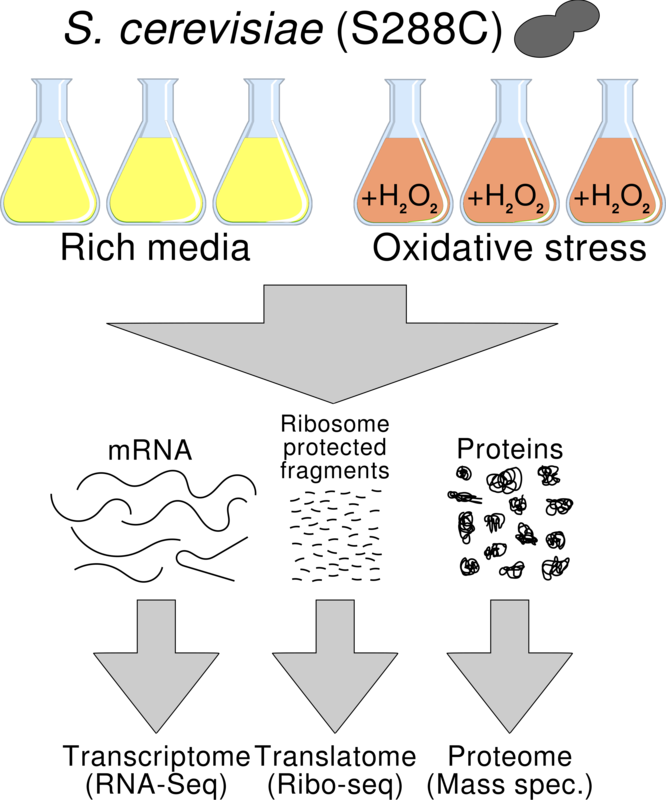 Others are located upstream of a main ORF and are translated in specific circumstances, inhibiting the translation of the main protein product. The translation of small ORFs can also be a step towards the birth of novel protein-coding transcripts. In recent years evidence has accumulated that some protein-coding genes have originated de novo from previously non-coding genomic sequences. This requires some degree of indiscriminate transcription and translation to generate precursors. In line with this we have found that many of the mouse-specific translated small ORFs appear to evolve under no selection (Ruiz-Orera et al., 2018). This finding defies the long-held notion that any protein that is produced must be functional. 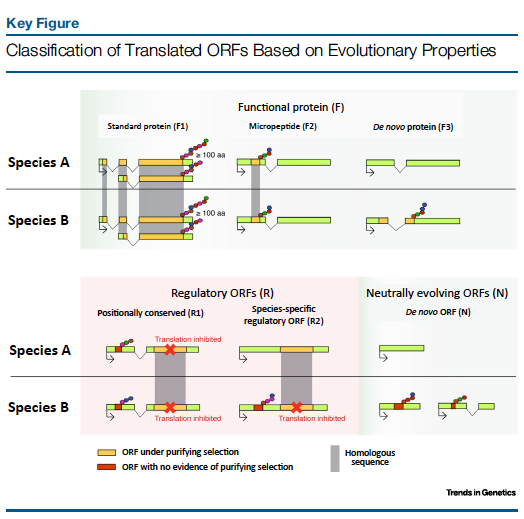 In Translation of Small Open Reading Frames: Roles in Regulation and Evolutionary Innovation (Ruiz-Orera & Albà, Trends in Genetics 2019) we review what is currently known about the small ORFome. To measure changes in the expression of the genes we normally compare mRNA abundances using high throughput RNA sequencing data (RNA-Seq), as a proxy for the changes in the encoded proteins. However, it is well known that the correlation between mRNA and protein levels is far from perfect. Ideally, we would like to measure changes in the proteins themselves. The problem is that proteomics-based techniques are less sensitive, and less reproducible, than high throughput RNA sequencing. How can we get closer to the protein world while maintaining high sensitivity and specificity? In a new study we propose to use Ribo-Seq instead RNA-Seq to perform differential gene expression analysis. Ribo-Seq is an RNA sequencing approach that specifically targets ribosome-protected RNA fragments and which shows higher correlation with proteomics data than RNA-Seq. We use this novel approach to study the response to oxidative stress in baker’s yeast. We show that the majority of genes that appear to be differentially expressed using RNA-Seq are not recovered with the Ribo-Seq-based analysis, strongly suggesting that many of these changes are not linked to changes in protein expression. This study highlights the advantages of using Ribo-Seq to understand not only translational regulation but also gene expression changes in general. Our new paper “Translation of neutrally evolving peptides provides a basis for de novo gene evolution” has been published in Nature Ecology and Evolution on March 19 2018. During the course of evolution, some genes are gained and others are lost. A well-established mechanism for the emergence of new genes is gene duplication. However, there is increasing evidence that some genes have not originated by gene duplication but de novo from previously non-coding regions of the genome. The two processes can be distinguished using sequence comparisons of closely related species. In gene duplication, the new gene retains sequence similarity to the other gene copy. In contrast, genes evolved de novo show no sequence similarity to other genes. In both cases, new genes initially appear by accident. A fraction of these genes will turn out to be beneficial and be subsequently maintained by natural selection. My interest in new genes started more than fifteen years ago. At that time, I was building a database of herpesvirus protein families at University College London. When I tried to cluster the proteins into families, some would just not cluster. These proteins had unique sequences, they did not resemble any other viral or host protein, yet they performed essential functions. Improbable as it seemed, they had to have originated from DNA sequences other than genes. 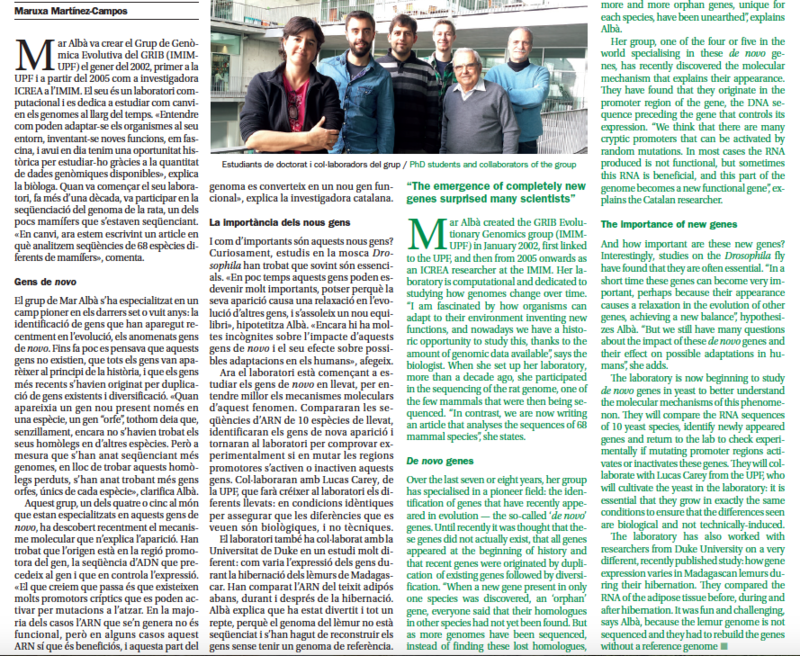 Back in Barcelona I teamed up with Jose Castresana to study gene evolution in mammals. In a paper published in 2005 we described many human and mouse proteins that lacked homologues in non-mammalian species. Following the current thinking at the time we proposed that many of them could have been generated by very rapid evolution after gene duplication. However, we also argued that it was possible that some of them had evolved de novo. The reason was that the coding sequences of the young genes were unusually small and this is something one expects for randomly occurring open reading frames but not for functional gene duplicates. Then, Macarena Toll-Riera joined the lab as a PhD student and we decided to revisit this question. With more genomes at hand, the hypothesis of de novo gene birth gained strength. 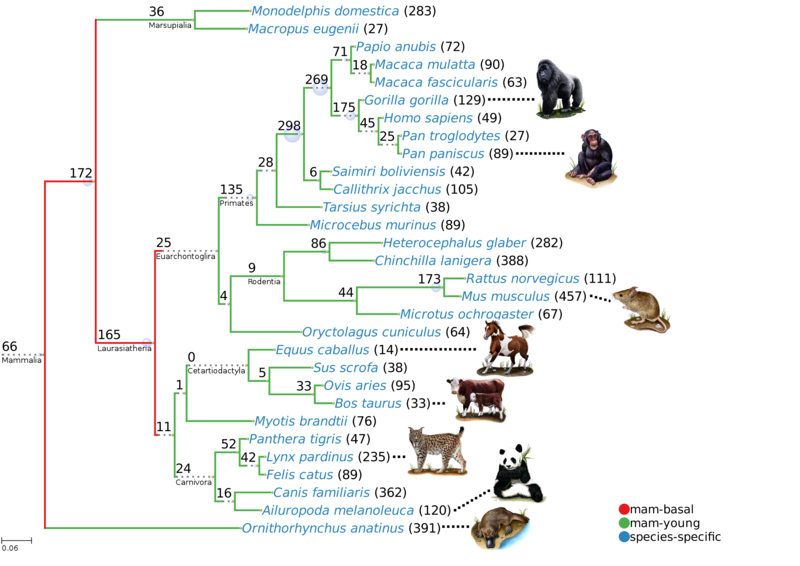 The results were published in 2009 in a paper entitled Origin of primate orphan genes: a comparative genomics approach. Things became exciting again when Nicholas Ingolia and co-workers reported, in 2011, widespread translation of the mouse transcriptome, including many transcripts previously believed to be non-coding. Jorge Ruiz-Orera, a new PhD in the lab, examined ribosome profiling data from different species and found clear support for the pervasive translation of the transcriptome. In the present study we have found that an important fraction of the translated peptides show no evolutionary conservation and evolve under no constraints. These peptides can be “tested” for new functions and eventually become new functional proteins, providing a basis for de novo gene evolution. More details of this study can be found here and in the Nature Ecology and Evolution community blog. 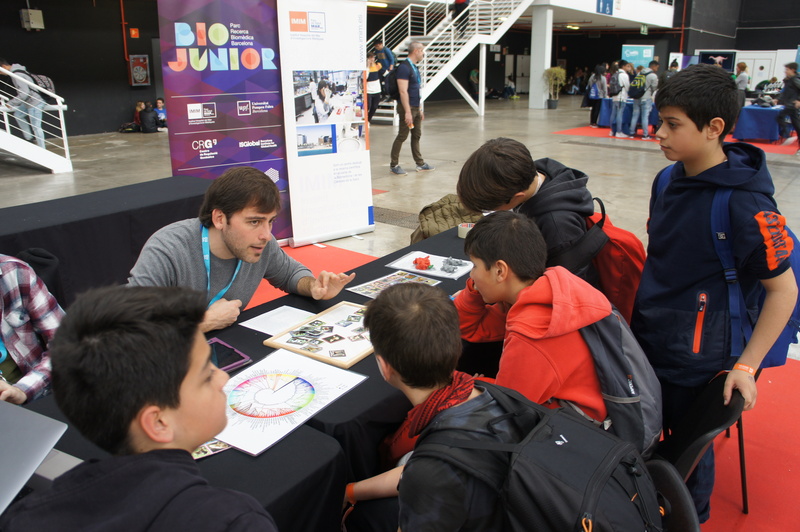 The Youth Mobile (YoMo) festival is organized by GSMA Mobile World Congress to promote STEAM areas (Science, Technology, Engineering, Art and Mathematics) among young people. 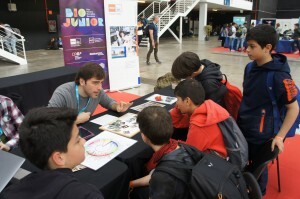 The different Centers of the PRBB could be found in the stand BioJuniors. Several members from our group were there on March 1st; they explained how automatic classification algorithms can distinguish between different dog breeds. When one thinks about hibernation images of grizzly bears waking up after a long period of inaction come to mind. However, this is a more common physiological adaptation than usually thought, and many mammals hibernate, including diverse species of rats, bats, squirrels and hedgehogs. Some years ago, hibernation was also discovered in lemurs, the closest group to humans known to hibernate. The type of lemurs that hibernate are fat-tailed dwarf lemurs, which use this adaptation to endure the dry season in Madagascar. Just before hibernation, in the so called fattening period, dwarf lemurs accumulate fat in their tails, which become very thick. This is the fuel that will allow them to survive during the several months they will spent buried in holes. We wanted to know more about the molecular changes that took place during hibernation in lemurs. Sheena Faherty and collaborators from Duke University visited Madagascar and collected small amounts of fat tissue from the tails of the lemurs, before, during and after the hibernation period. We reconstructed the complete transcriptome from the RNA in the samples and investigated changes in gene expression during hibernation. We could detect a switch from fat storage to fat degradation, as well as inhibition of mitochondrial functions and increased protection against oxidative stress. 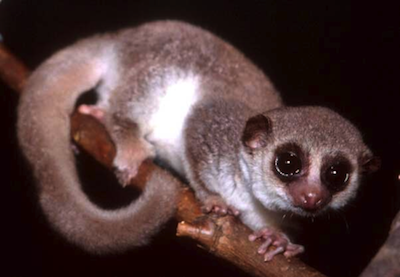 Until recently, we knew very little about dwarf lemurs at the molecular level. Challenging as this project was, it was a joy to dive into a complete new world. The results of this study have been published in Faherty SL*, Villanueva-Cañas JL*, Blanco MB, Albà MM, Yoder AD. 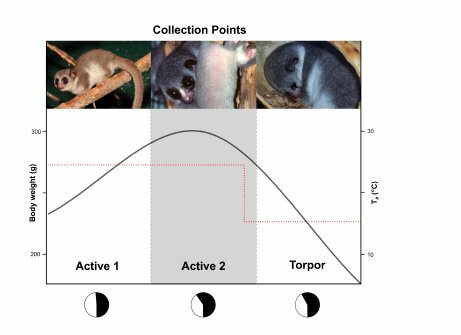 Transcriptomics in the wild: Hibernation physiology in free-ranging dwarf lemurs. Molecular Ecology, 29 January 2018. Ribosome profiling is a sequencing tecnique that detects regions in mRNAs that are being translated. Using this technique, researchers have observed mysterious patterns of translation in many transcripts believed to be non-coding (lncRNAs, or long non-coding RNAs). The patterns are very similar to those observed in protein-coding genes but the translated proteins are generally smaller. Aside from their sequence, we know nothing about these peptides. Are they functional? Do they reflect some background noise of the translation machinery? In a recent study published in bioRxiv we have investigated the signatures of selection in proteins translated from lncRNAs, using phylogenetic conservation and single nucleotide polymorphism (SNP) data. We have found that hundreds of mouse lncRNAs produce short functional proteins and thus should be considered protein coding genes. However, the largest part of translated lncRNAs appears to correspond to non-functional peptides. We conclude that, translation, like transcription, is pervasive. Due to this activity many peptides can be tested for new functions, facilitating the birth of new genes de novo. This preprint was selected by the NODE (July 2016). It has also appeared at redcedar PRBB blog. The work was presented at XXI Evolution and Population Genetics Seminar Oct 3-5 2016 Sitges (Barcelona). We have published the first study on the molecular processes underlying primate hibernation. The study is the result of a collaboration between researchers at IMIM (Hospital del Mar Medical Research Institute, Barcelona) and at Duke University and Duke Lemur Center (Durham,USA). The work is based on the fat-tailed dwarf lemur (Cheirogaleus medius), an extraordinary primate that is capable of enduring torpor (hibernation) for several months, subsisting only on the lipids stored in its tail. The project has used high throughput RNA sequencing (RNAseq) data to learn about the changes in gene expression in white adipose tissue during hibernation. How can we analyze genomes? What is junk DNA? Why is bioinformatics useful? 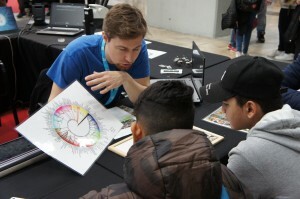 Today, members from our group have been trying to explain these questions to the visitors of the Education Fair. 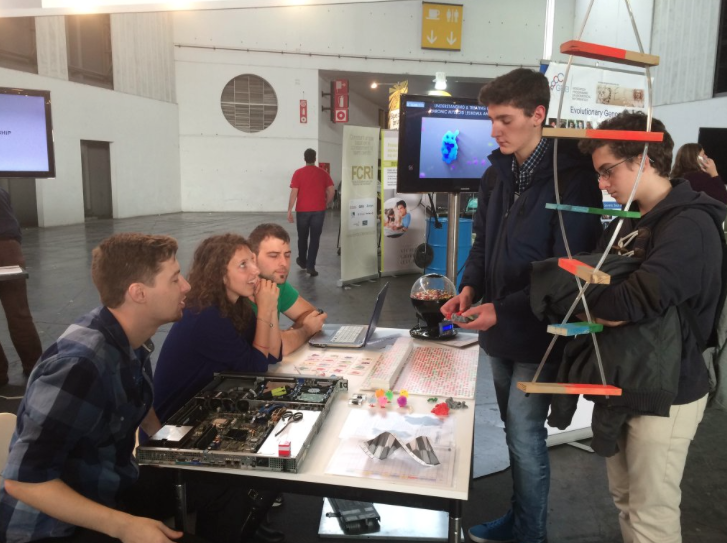 The stand included a very realistic piece of “recycled” DNA and 3D printed protein structures.